I’m just back from the Oceania exhibition at the Royal Academy and was struck by how many of the 200 artefacts from the Pacific on display used coconut fibre as a material, writes Dr Susan Aldridge, our dedicated guest blogger and freelance writer and editor based in London, with an interest in medicine, health, science and food/nutrition, provides her advice and three scrumptious recipes. The coconut, which is the seed of a tropical palm tree, might be the most complete plant on earth. Besides the fibre, it provides flesh, which can be processed into oil, flour and milk, and water which comes from the centre of the nut. Meanwhile, the blossom of the palm provides a sweetener in the form of coconut blossom nectar. So, let’s celebrate the coconut palm with some healthy recipes that use no fewer than five of its edible products. As coconut water is rich in potassium and known for its hydration properties, this juice is a healthy post-exercise choice. Juice the kale, pear, cucumber and ginger. Top up with coconut water and a dash of pomegranate juice to boost the antioxidant content. 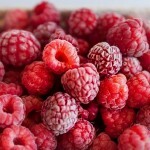 Place berries in a blender/Nutribullet. Add the matcha, peanut butter and cacao. Top up with the coconut milk and blend. Coconut flour is pure coconut, derived from the flesh of the nut. It is higher in fibre and protein, and lower in carbohydrate than whole wheat flour. 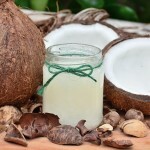 Coconut blossom nectar is classed as low glycaemic index (a value of 35, compared with 68 for white sugar). I thought I’d need more than one go at getting these right. Substituting coconut flour for wheat flour is one challenge (it absorbs more liquid). Using chia seeds instead of eggs (a common vegan substitute), coconut blossom nectar instead of sugar and replacing butter with coconut oil pushes this recipe into unknown territory with respect to texture and flavour – the main issue being what quantities to use. I researched, but this is an original recipe, I promise. The flavour comes from the addition of the cacao plus cinnamon powder. Heat the oven to 180°C. Mix the dry ingredients in a bowl and add the coconut oil. Then add the boiling water and mix well. Leave for about 10 minutes to melt the coconut oil and let the chia seeds create a gel. Make cookies from balls of the resulting dough, and cook in the oven on a greased baking sheet for around 25 minutes. You can replace potatoes with other root vegetables that contain more vitamins and fibre, without sacrificing any of the comfort or taste element. The recipes below would work well at a Halloween/Bonfire supper or party if you’re planning late autumnal events. Also, I’ve been struck by the number of food delivery bikes in my area over the last few months. Look, I know we’re all busy, but I personally think we’d all be a lot healthier in the long term if we invested a bit of time in learning to cook from scratch, so we know what’s in our food. Our guest blogger, Dr Susan Aldridge, freelance writer and editor based in London, with an interest in medicine, health, science and food/nutrition, provides her advice and three scrumptious recipes. Decided to rebel a bit against the food delivery people (we all know who they are…) and made my first two recipes slightly complicated (for me!) in that they involve stages and sauces. Preheat oven to 200˚C. Heat the onion in the milk with black pepper and herb salt to season. Simmer for 10 minutes and set aside. Measure out about 50ml for the mash. Meanwhile, place the fish in a frying pan, add the rest of the milk, a knob of butter and simmer for a few minutes, turning the fish part way through, until fish is tender. Flake the fish on a plate and set aside. Now make a sauce by melting the butter, stirring in the flour to make a paste, Then, add the milk from the fish and stir till thick and smooth. Add the fish sauce and the parsley. Assemble the fish pie by mixing the flaked fish, hard-boiled eggs and mushrooms. Cover with the sauce. Leave to cool while you make the mash. Boil the cauliflower till tender and mix with the butter beans, reserved milk and mustard. Use a hand masher to make a smooth mixture. Now add the mash to the cooled fish to make a layer, and top with sliced tomatoes and grated cheese. Bake for around 30 mins, till the top is browned. Serve with two green vegetables (we had tender stem broccoli and green beans). 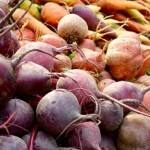 Turnips, swedes and carrots are all significantly lower in carbs than potatoes and parsnips contain somewhat less carb. So, the mixtures give you a mash that is lower carb and higher fibre than regular mash and also contributes to your fruit and veg intake, which potatoes do not. Make the lentil filling by frying the onions in coconut oil until soft, then add lentils. Heat through and add tomatoes, tomato puree, herbs and cinnamon. Cook until lentils are soft (around 20–30 mins) and, in the meantime prepare the mash. Boil the root vegetables till tender. Then add oil (for vegan version) or butter/cream/milk (vegetarian version) to add smoothness. Add extra flavour by stirring in mustard and/or marmite. Cool the lentil mixture for 15 minutes or so, to ensure the mash doesn’t sink into it. Then add a thick layer of the mash, finish with sliced tomatoes (vegan version) and/or grated cheese (vegetarian version). Bake in the oven for around 20 minutes, until the top is brown. Serve with something green (eg stir fried spring greens or cabbage and shredded leek). Heat the oven to 180˚C. Add the sweet potato chips to a bowl and toss with the rosemary and olive oil. Place on one half of a baking tray lined with foil in the oven. Meanwhile, toss the beetroot with rosemary and oil and place in the oven on the other half of the tray when the sweet potato has been cooking for around 15 minutes. Cook for a further 15 minutes till browned. Make the dip by mixing the quark and the pesto (multiple other combos are available of course – try cottage cheese, soy sauce and peanut butter, for instance). Apologies for the length of the first two recipes. November’s recipes will be simpler! Chia seeds may be tiny, but they are packed with vital nutrients so if, like me, you hadn’t tried them previously, it’s well worth starting to include them in your diet. They come from the Salvia hispanica plant, which is native to Central and South America and a member of the mint family. 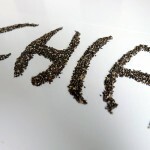 It’s said that they were used in the ancient Mayan and Aztec civilisations as a source of energy (the word ‘chia’ means ‘strength’ in the Mayan language). 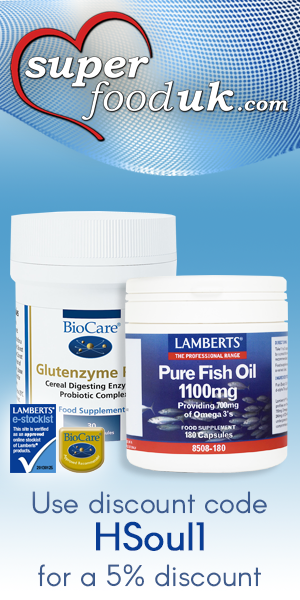 The seeds are rich in fibre, omega-3 fatty acids and are a good source of plant protein. They taste a bit neutral, compared with other seeds, but they do have the interesting property of rapidly absorbing liquid to form a gel. This is the basis of ‘chia pudding’ (see recipe below) and also means you can use chia seeds as an egg substitute or thickening agent if you’re vegan. There’s some (albeit rather limited) evidence that chia seeds might help you lose weight and, maybe, help prevent diabetes and heart disease. As ever, don’t rely on getting direct health benefits from chia seeds, but perhaps try including them in the ‘healthy balanced diet’ we always advocate to add variety and interest. I’ve been collecting blackberries from my local nature reserve and used them with chia seeds to create this beautiful pink-purple smoothie, with my usual cacao and matcha boosts. Blend all ingredients in a Nutribullet, or similar and drink immediately. I’ve added chia seeds to my usual mix of sunflower, pumpkin and linseeds that I use for adding to salads. Mix all the ingredients except the pomegranate seeds. Dress the salad with linseed oil, cider vinegar and lemon juice and top with the pomegranate seeds. I saw the possibility of creating a very healthy chocolate pudding with chia seeds. No sugar, no dairy and with, hopefully, the texture of chocolate blancmange (anyone seem blancmange in recent years?) or mousse. 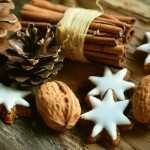 There are many recipes online and lots of yummy pictures. I did some research and here’s my experiment. To be fair, the texture is a bit more tapioca (if you’re old enough to remember that pudding!) than blancmange/mousse, but I’m excited by my discovery of a cacao powder blended with cinnamon, which adds a luxurious depth of flavour to this dessert. Whisk all these ingredients together in a bowl and chill overnight. Serve topped with berries. Without getting too heavily involved in the low carb, low sugar, low glycaemic index debate, I’d like to offer up just a few suggestions…My first thought was to look for lower carb versions of favourite pasta, rice and potato dishes. But I couldn’t face fish pie or shepherd’s pie with ‘alternative’ mash in this weather (I’ll be back with those in a couple of months) – so I’ve gone for a refreshing fruit smoothie instead. And when I say sugar, I generally mean a simple natural carbohydrate like fructose rather than added sugar, which is usually sucrose. I’d usually make up a smoothie with hemp/almond/coconut milk, but the presence of the lime will make it go lumpy, so I used cactus water, which is lower in sugar than coconut water. I’ve added the matcha and cacao, as I do to all my smoothies for an extra healthy boost. The result has a refreshing sharpness that I think you’ll love! Add all ingredients to your blender/Nutribullet, using the cactus water to make up the volume. Blend and drink immediately. You can find pasta made with a wide variety of grains, with lentil and spelt pasta being the most readily available. The one with the highest protein/carb ratio I discovered was edamame fettucine. I made up my favourite sauce to serve with the pasta…substitute your own. Fry the garlic and chilli till soft in olive oil then add the other ingredients and simmer until thick. Cook the pasta as per instructions on the packet, drain and serve with the sauce. Finish with torn basil and grated pecorino. Makes a good pasta salad when cold, or reheat. Use quinoa instead of rice, and twice as many green veg as in a traditional risotto recipe. Cook the green veg and quinoa. Mix together and add the spring onion and tomatoes. Finish with chopped herbs and grated pecorino cheese.